Welcome to Spring! Mother’s Day is fast approaching – do you need any present ideas? If so, we’ve got lots – all at affordable prices. 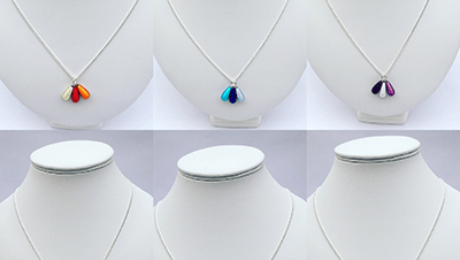 Make sure you take a look at our new range of Pendant Necklaces. They come in Single or Triple Raindrop shaped Glowbeads, in lots of different colours and colour combinations. 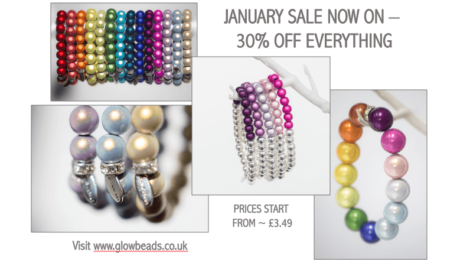 Hi Everyone and a Happy New Year from the Glowbead Team. We have just started our January Sale – we’ve got a whopping 30% off everything online until 31st January. Just use JANSALE17 code at the checkout to receive your discount. Happy Shopping. Welcome to our new Website. We have created a much larger range of Jewellery and Accessories for you to wear and enjoy. We hope you love them as much as we do! Grow your Glow this Summer with Glowbeads – why not treat yourself to one of our new Necklaces or a pair of earings?